An extremely versatile management and regulation system for all types of FYM and Granular belt spreaders. 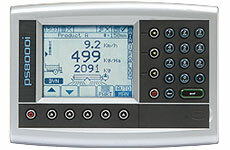 The RDS Apollo is a userfriendly,fast-responding,automatic regulation system for all types of spreader. Application Rate Control proportionate to Forward speed by Hydraulic floor speed. Weighing on main screen displays live weight from load cells and self-calibrates. Ability to easily change the application rate on the move. Optimisation of product application ensuring an even application rate across field at a wide range of forward speeds. Traceability of where product has been applied for Customer and Environmental Agency purposes.